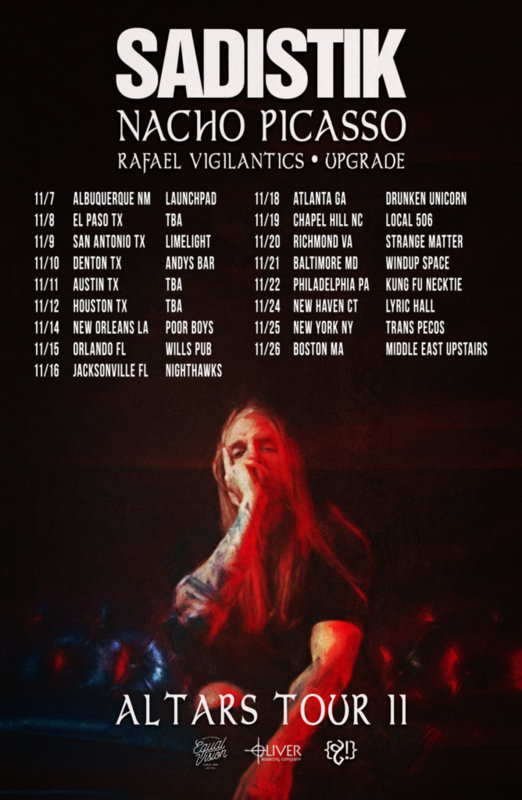 One of the most respected emcees in the world of alternative hip hop, Sadistik, will be hitting the road this November in support of his recent Equal Vision Records full-length Altars. The tour will begin on November 7th in Albuquerque, New Mexico at The Launchpad and continue to make it’s way east to the coast, culminating in his first trip to the Atlantic side of the country since the release of his latest critically-acclaimed record. You can see all tour dates below and tickets are available here. Altars is a cohesive artistic statement that bucks against the trend of disposable hip hop that has become commonplace in recent years. The focus is on creating a singular vision, voiced collectively through each aspect of the project, that speaks to the listener. One needs to look no further than the artwork, which was created by Michael Hussar (best known for his oil paintings which have sold to the likes of Kat Von D and Madonna), to get a glimpse into the artistry and attention to detail that went into Altars. Sonically and lyrically, the record is emotive, it is raw, and most importantly, it is honest; culminating in a release that will undoubtedly solidify Sadistik’s well-earned position as one of the most respected artists in the world of alternative hip hop. Sadistik has been described as “showing his scars with each song he writes”, as well as, “the cigarette burn rap king”. He’s developed a cult following since the release of his 2008 debut The Balancing Act. His unique style of hip hop, which draws upon “dark imagery, dense wordplay and nontraditional production styles” has gotten more innovative with each of his releases since. On his most recent album, Altars, Sadistik worked with luminaries of hard rock, Equal Vision Records, a label known for encouraging their artists to explore uncharted territory and doing whatever it takes to help facilitate the artist’s vision, on his new record.